Once the holidays are over, it's officially time to start wallowing in the next three months of misery known as "winter." The best antidote to February is probably a jaunt down to the islands; but second-best, while much easier, is looking forward to the bonkers fun that warm weather will bring. 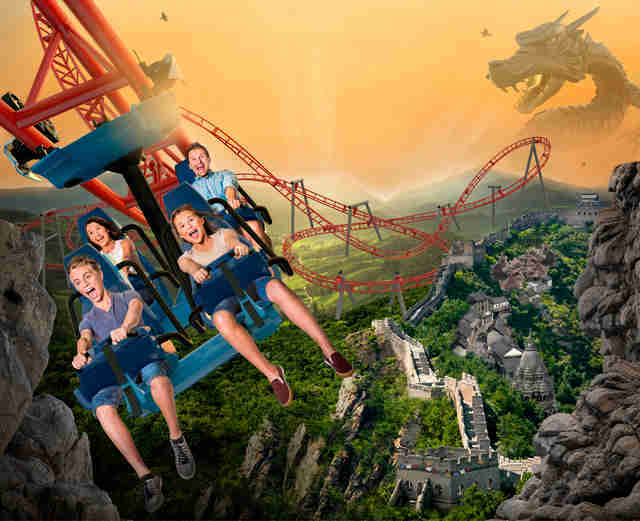 Among those summertime dreams are annual trips to some of our nation's -- and maybe the world's -- great theme parks to try out the ridiculous new rides they spent the winter putting together. 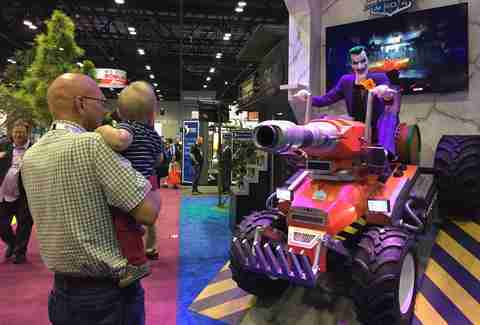 We took a look at this fall's International Association for Amusement Parks and Attractions (IAAPA) Expo in Orlando, where ride makers and park operators convene to show off their latest and greatest. Here are the best of the new crop of rides you'll want to hit in 2017. This 4D interactive ride will debut at three different Six Flags parks, and feature riders in motion-platform vehicles helping Batman, Superman, Wonder Woman, and Green Lantern fight to save Metropolis from the Joker and Lex Luthor. Each vehicle will be equipped with laser guns, which riders will use to fight animatronic figures and video displays as they make their way through the city. The California version will also feature a twist on the ending, plus the thrill-ride debut of Harley Quinn. The highest-rated show in cable history finally has its own ride. Though the Sally Corporation is pretty tight-lipped about details of what will happen on the ride, it'll be a motion-based vehicle game where riders try and fight off the extinction of the human race, getting absorbed into the same post-apocalyptic world they see on the show. It'll include real fire, fog, and wind, plus 3D scenes and interaction with the living dead. Basically it's as close to an actual zombie apocalypse as you'd ever care to get. Though one could argue people actually HAVE stepped inside their smartphones in a sort of existential kind of way, this new dark ride has guests literally stepping inside the massively popular smartphone game Five Nights at Freddy's. 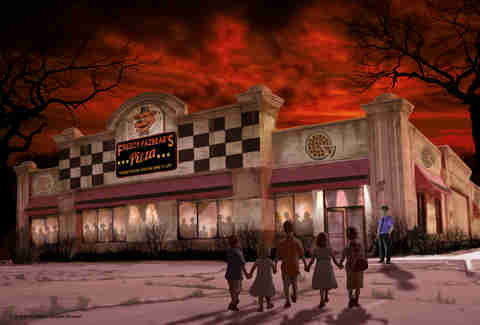 Much like in the game, guests step inside the Chuck E. Cheese's from hell that is Freddy Fazbear’s Pizza, and fight off deranged animatronic animal robots using nothing but a flashlight and closing doors. The goal is to survive until opening at 6am. Sometimes you will... and sometimes you won't. So it'll be worth multiple trips to see the different endings. Ever wonder what it'd feel like to be Wonder Woman's lasso? Keep your mind out of the gutter and imagine yourself being flung in a circle at speeds up to 40mph, 24 stories in the air, looking out at the DC 'burbs and trying to keep it together. 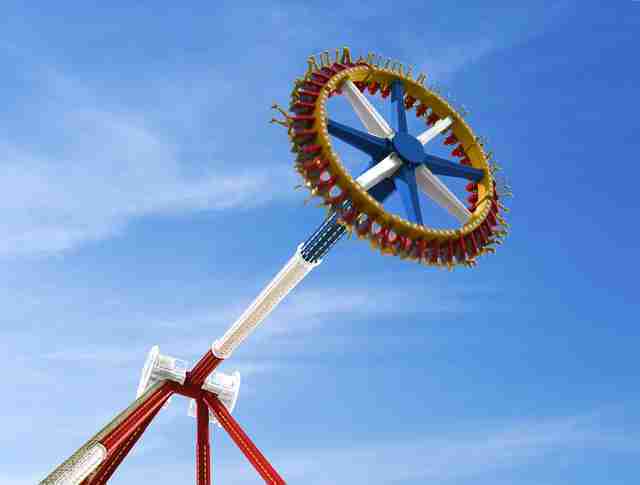 That's what's in store at this new extreme swing ride that moves guests in a 98ft circle. At 242ft tall, it's the highest structure at Six Flags America. It's also the first ride dedicated solely to Wonder Woman, though sadly no invisible jet ride is planned anytime soon. Jet Skiing at emergency rescue-speed across the ocean and catching epic amounts of air can be a great time, but can also be insanely dangerous. This new Jet Ski-roller coaster hybrid gives you the same sensation without even having to put on a swimsuit. The ride has guests straddling a Jet Ski as it screams along a track through the water at 44mph, up 60ft hills designed for catching maximum air, and around banked and serpentine turns. The idea is to simulate SeaWorld's animal care team missions, and it's loosely based on the Sea Rescue TV program. Americans take it for granted: If we want to experience a dueling dragon roller coaster, we need go no further than the Wizarding World of Harry Potter in Orlando. Europeans weren't so lucky, till now. This new ride at Belgium's Bellewaerde park will be Europe's first dueling coaster ride, where dual tracks will race through alpine forests with guests hanging below. It's also built on an artificial hillside, which guests will hike through on their way to the ride-loading zone atop a picturesque tower. Alright, so it's not a ride, but for Star Wars geeks: HOLY EFFING S, IT'S THE FORCE AWAKENS MADE OF LEGOS!!! The LEGO display will capture the first 30 minutes of the film with displays representing the first six scenes, as well as a 16ft LEGO model of the Star Destroyer Finalizer. It'll be the largest model in the Star Wars Miniland's history, and will debut to kick off the park's annual Star Wars Days on March 4th and 5th, 2017. 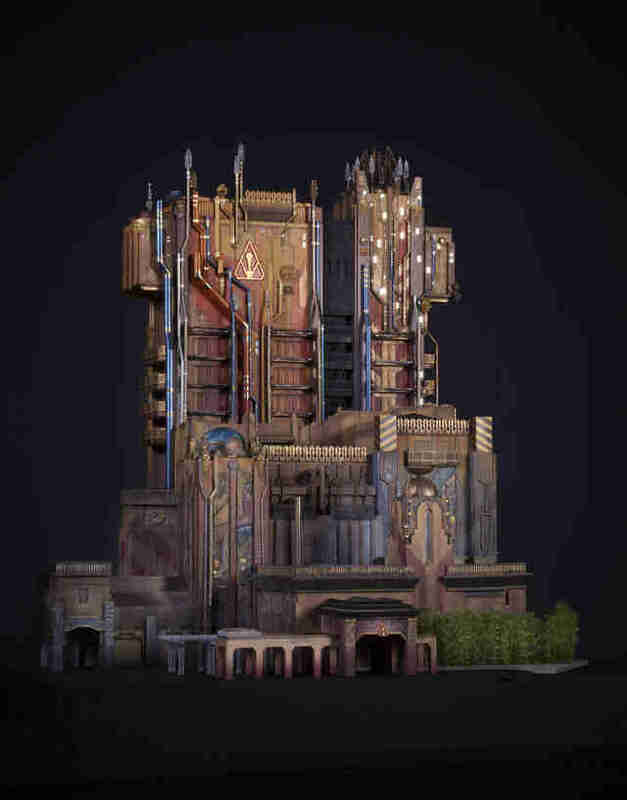 Guardians of the Galaxy -- Mission: BREAKOUT! 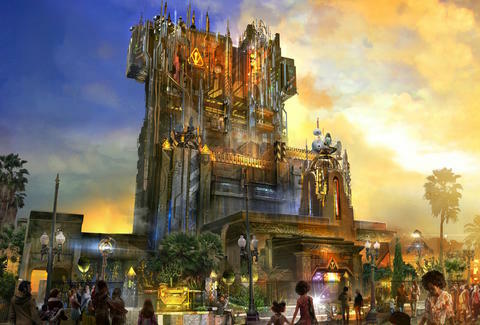 RIP Tower of Terror, though, really, not too many people born after 1980 were getting the Rod Serling references anymore. So the old Hollywood Hotel has been transformed into the museum of Taneleer Tivan (aka The Collector), an eccentric hoarder whose latest acquisition is the Guardians of the Galaxy. Park guests will help Rocket -- the lone escapee -- in a daring rescue that culminates with the ride's trademark 13-story drop, never quite the same twice. Four-dimensional rides are great and all, but when ghosts already inhabit said fourth dimension, where is a motion-platform vehicle equipped with laser proton pistols and ghost traps to go? Yo, get ready for that fifth dimension. It's a dark ride, so the sun won't be shining in, but it will be a ride with eight passengers aboard Ecto-1, fighting ghosts alongside the Ghostbusters. And WHICH Ghostbusters will it be? Oh, just a combination of the Bill Murray and Kristen Wiig crews. So both boys and girls can have a ghost-busting hero to blast along with. OK, so a ride based on a Swiss children's book most famous for interrupting a Monday Night Football game doesn't sound like a real enticement to cross the pond. But Europe's newest wooden roller coaster is also going to be one of its best, a 70ft behemoth with almost 2,000ft of track that rattles visitors along at speeds up to 45mph (or 71km/h, if you want to talk like a local). 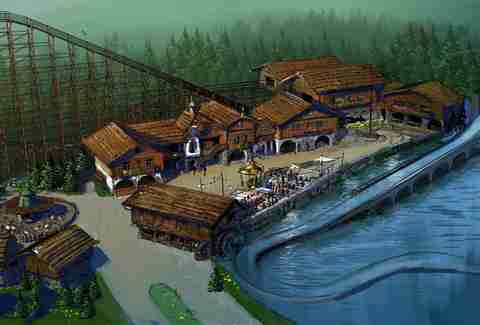 It will be the park's first wooden coaster, anchoring an entire section of the park called "Heidiland." Somewhere a Raiders fan is planning not to miss this. Perhaps the coolest new pure roller coaster hitting US theme parks this year is InvadR, a wood coaster with steel supports that's using repurposed cars from Busch Gardens Tampa's beloved and defunct Gwazi ride. The first wooden roller coaster at BG Williamsburg will take riders through the woods and an underground tunnel, and up nine airtime hills including one epic 70ft drop. Matt Melzer is a staff writer with Thrillist. But only until he's able to develop the world's first 6D ride. Follow his progress on Instagram @meltrez1.